Watermelon is a fantastic summer fruit because it’s juicy and sweet and loaded with water. While drinking plain water or fruit-infused water can help keep hydration levels topped off, it’s also helpful to eat food with a naturally high water content, like fruit salads with watermelon. This recipe calls for the use of light olive oil or avocado oil as the dressing base. Avocado oil has a nearly neutral flavor, which is generally the desired taste for oil in a fruit salad. A “light” olive oil refers to the flavor of the olive oil, not the fat or calorie content. For this fruit salad, a light olive oil is preferred over regular olive oil. 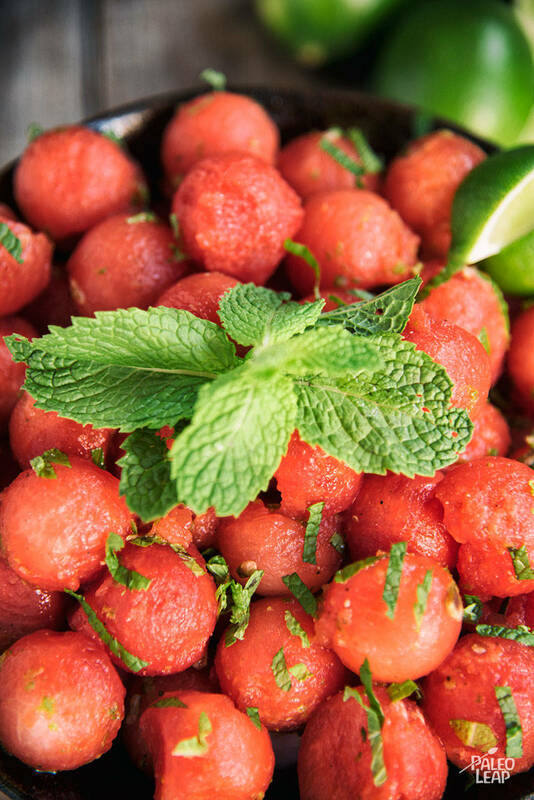 The sweetness of watermelon, combined with the refreshing taste of lime and mint make this salad more like a dessert than a salad! Pair this salad with a grilled chicken or citrus chicken recipe for a cool, summer meal. Scoop the watermelon using a melon baller. Form into round balls, or cut into cubes using a knife. In a small bowl, whisk together the olive or avocado oil, lime zest, lime juice and mint. Pour the lime juice mixture over the watermelon, and toss until well coated.